This Cowboy Casserole is the best comfort food and a dinner the whole family will love. 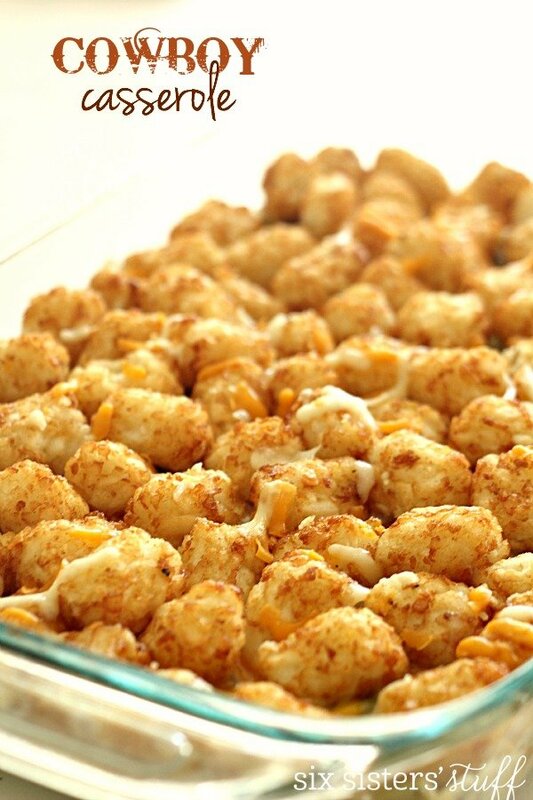 Even the picky eaters will love this tater tot inspired meal. It's easy to make and tastes delicious. I had never had “Cowboy Casserole” (aka Tater Tot Casserole) until after I met my husband. Whenever he is in charge of the meal, this is his go-to dish. He asked why I hadn’t put it on the blog yet, so I decided to share this easy “comfort” food with you. Step 1: Preheat oven to 375°. Step 2: In a large skillet, cook beef and onion over medium heat until beef is no longer pink. Step 3: Drain grease, then stir in the corn, soup, 1/2 cup cheese, milk, sour cream, and seasonings. Step 4: Pour beef mixture into a 9×13″ baking pan. Step 5: Top with frozen tater tots (try to keep them in a single layer) and then sprinkle remaining cheese on top. We have never had a problem with our tater tots going soggy, but we have had friends and family cook their tater tots separately then added them a little before it is finished baking. They also add the cheese on top to finish the baking. Step 6: Bake uncovered for 25-30 minutes or until cheese is bubbly and tater tots are thoroughly cooked and golden brown. If you have picky eaters, this recipe is for you. My kids that refuse to eat anything but mac n cheese and chicken nuggets, devour this dish. My husband loves the meat in this, mixed with the potatoes. Could it get more manly than that? My family also likes to drizzle ketchup or barbecue sauce over the casserole when eating. This is optional but also delicious. It may also help the picky eaters give it a try. Could Cowboy Casserole be a made into a freezer meal? This recipe could most definitely be made into a freezer meal. Assemble the casserole as you would before cooking. Wrap it neatly and tight with multiple layers of aluminum foil and saran wrap to avoid frost and freezer burn as much as possible. We would recommend eating this within 3-4 months of making. Did you know Six Sisters’ Stuff has a youtube channel? 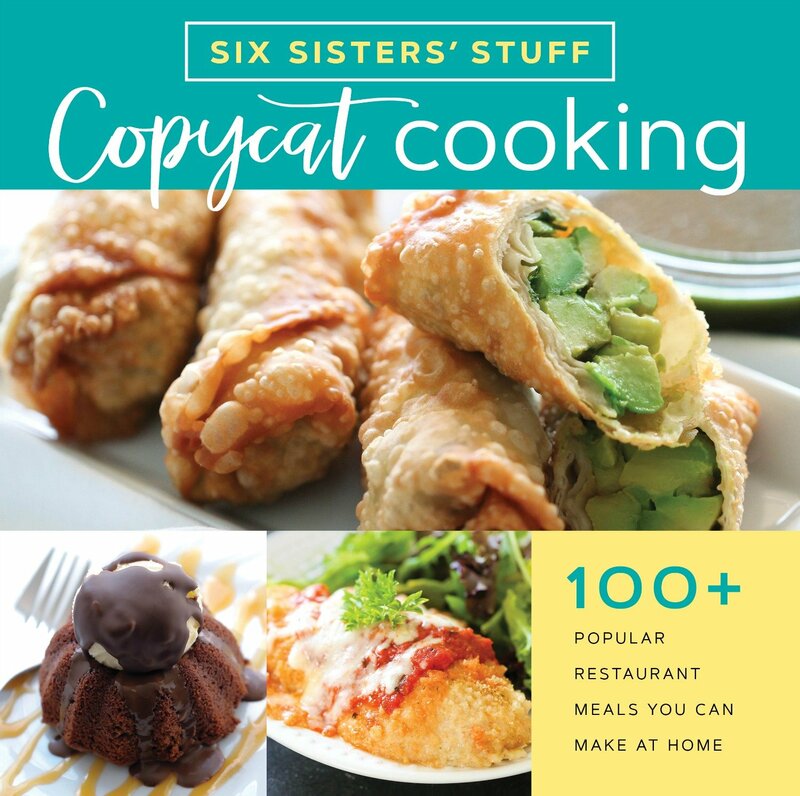 Six Sisters’ Stuff now has a Youtube Channel where we show you how to make hundreds of simple recipes, your family will love. looking for more delicious casserole recipes? This casserole is one of my husband's favorites - he has loved it since childhood! In a large skillet, cook beef and onion over medium heat until beef is no longer pink. Drain grease, then stir in the corn, soup, 1/2 cup cheese, milk, sour cream, and seasonings. Pour beef mixture into a 9x13" baking pan. Top with frozen tater tots (try to keep them in a single layer) and then sprinkle remaining cheese on top. Bake uncovered for 25-30 minutes or until cheese is bubbly and tater tots are thoroughly cooked. Hi ladies! Love the simplicity and deliciousness of how this recipe looks, but before I make it, I want to confirm a step: I do drain the meat once browned, right? I know that's "a given", but I always ask because I *have* had a few that said No, because there was a purpose for not doing so. Thanks! You will want to drain the grease. We made changes to the post! Thanks for alerting us to that correction! Thanks so much for stopping by our blog!! Can you add something else in place of Cream of Mushroom soup as my family will not eat anything with mushrooms?! We make a version of this that is found in the Dump Casserole cookbook - but is also fondly called the Tater Tot Casserole. We use Cream of Chicken, and instead of onions, we use 1/2 a packet of Lipton Onion Soup mix and pour over the cooked hamburger and cream of chicken soup mix. I've also switched it up and used beef gravy or chicken gravy instead of the soup. And to even switch up the tater tot idea even more, we changed the meat, and changed the "sauce"/"gravy". For example, I used diced ham, and made a cheese sauce, then topped w the tater tots. And another version I used chicken and used an alfredo sauce, and topped w tater tots. Of course we change things up w different cheeses each time. We have done it and since my family is cheese heads, we use cream of cheddar soup. I have seen a recipe close to this and it called for tomato soup ...I have made it and it was very good .... and it called for mozzarella cheese instead of cheddar . My sister in law uses either the Fiesta nacho cheese or the cheddar cheese Campbell's soups. I've always made mine with Cream of Celery soup and it's great! i see the tater tots get crispy on the outside but are they soggy underneath? I cooked my tater tots until crisp before adding them. I also partially baked the casserole and then added the crisp tater tots and finished baking the casserole. Then topped it with cheese, etc. It turned out really good, not soggy. Can I use ground venison in lua if the ground beef? Yes, you can use ground venison. Instead of baking this has anyone ever tried it in a slow cooker??? I have heard of this casserole for years, but never made it until tonight. My family gave it great reviews. There was very little left over by the time we each had several helpings! Can this one be does as a freezer meal? If so, what would be the steps? Just make as directed in a pan that can be put in the freezer. Do not bake. Cover tightly and when ready to bake, take out and thaw. Cook as directed. May need a little extra cooking time if not thawed completely. Just watch it closely. This has become my family's favorite dish. However, since we don't eat beef, I make it with ground turkey and it's just great. Also, we don't do dairy for the most part, so I've substituted Tofu sour cream, almond milk and non-dairy (Dayia) shredded cheddar cheese. All work perfectly. I've always made it with Cream of Mushroom soup (I know it has some dairy in it) but I'll try it with Cream of Chicken soup next time. Thanks for sharing the recipe. Is this the cowboy casserole a gluten free dish? Oreida tator tots are gluten free and you can find GF cream of mushroom soup. Scroll down to the bottom of the post and you'll see where it says "Get Nutrition Info"
I made this tonight exactly how the recipe instructed. It turned out yummy. The tatertots were crisp and the filling was tasty. Everyone in my family gave it a thumbs up. We’ll make it again! I have made this recipe a number of times and it's delicious. I'm expecting baby #1 in a little over a month and am looking for freezer meals. Do you think this would freeze ok? Hi Brenda. Congrats on the upcoming baby. How exciting!! I went back and read over the cowboy casserole post. I think you could assemble it and cover well to be used as a freezer meal. Just thaw and cook. It should work great. It does freeze very nicely. Has anyone tried this using onion soup mix? If so how did it turn out? I made this casserole with the assumption that my kids (picky teens) might not like it. They loved it! Even the hubby was lovin it! They asked if I could make it at least once a week. Big win! It's so easy to make. Wouldn't change a thing in the recipe. Made this and it was a hit. Will definitely make it again. My daughter and I made this today. She renamed it Lazy Shepherds Pie! Our first tater tot receipe. Thanks. Made this cowboy casserole and it was delicious,would not change a thing in the recipe! Great taste, very easy. I used turkey instead of hamburger and it was amazing. I also precook my tater tots while the meat is cooking. I've made this several times and it's always a hit. I also used a large can of cream of mushroom with 1 cup of milk. We like it creamy. Reheats well in the microwave.